Let’s face it. There are a lot of companies in the commercial solar market. If you’ve been asking yourself those types of questions, a new report from GTM Research clears up some of the confusion and confirms what many insiders already know: SunPower is the No. 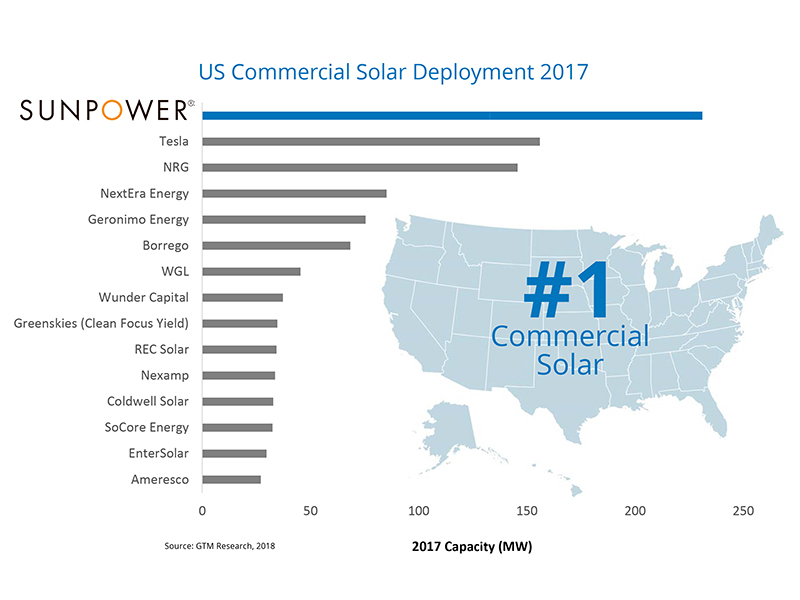 1 U.S. commercial solar provider based on 2017 capacity of on-site projects. At SunPower we’re incredibly proud of this recognition. But it didn’t happen overnight. In fact, it took more than 30 years of designing and manufacturing the best solar products and solutions worldwide to earn that ranking. What makes me most proud is that this report is based on information collected from installers, developers, asset owners and financiers. In other words, real-world results make a difference, and we couldn’t thank our dealers and customers more for helping us achieve that No. 1 position. We’re also pleased that the solar industry has recognized our unique business model of selling both directly to customers and through a carefully vetted network of local dealers, an approach that offers many advantages to anyone buying solar technology. It allows us to serve and partner with large national brands and organizations that might have multiple locations, but we’re also nimble enough to understand the regional nuances that are relevant to local businesses such as weather patterns, local policies and unique utility markets. Our projects with Toyota and Cool Earth Solar illustrate both ends of this spectrum. GTM understands this comprehensive view of the marketplace, and its report designates SunPower as “the clear leader” when it comes to commercial solar. So, what does that mean for a business seeking out the best solar company? It means you get an experienced and committed partner with industry-leading technology (such as breakthrough PV technology and SunPower® Helix™ Storage), extensive partnerships and a proven track record of solving some of the most challenging solar projects across the last three decades. With more than 9.2 gigawatts installed worldwide and more than $10 billion financed, it’s no wonder SunPower is the trusted commercial solar provider for so many forward-thinking organizations. GTM's report has recognized our clear leadership in this market. And I couldn’t agree more.